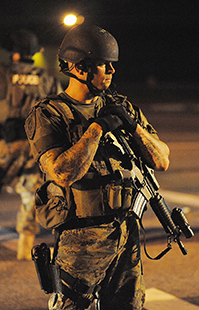 Has U.S. law enforcement become militarized? The killing in August of an unarmed, black 18-year-old by police in Ferguson, Mo., has intensified a long-simmering debate over how police do their jobs. The shooting of Michael Brown by white officer Darren Wilson has led to angry and sometimes violent protests, initially heightened when police in military-style gear and armored vehicles responded to the unrest. The tactics highlighted what some criticize as the “militarization” of America's police forces, fueled by a Pentagon program that supplies local police with surplus weapons and vehicles. Others say police overuse SWAT teams to serve warrants and enforce drug laws. The Ferguson shooting and other recent high-profile police killings of unarmed African-Americans also has ignited a national outcry against what many say is disproportionate police action against black males. Police respond that low-income communities of all races have the highest crime rates and that they need military-style equipment to defend themselves in a heavily armed society.